I was recently invited to teach intro to yoga at my girls’ school. My co-teacher (whose son is in 5th grade with my girls) and I knew teaching K-8 kids would be a whole different ballgame from the adult classes we normally teach. We knew that not because we’re wise, but because we have tried to teach them only to be met with the predictable “I hate yoga! It’s so boring!” So while our curriculum may not have been ready, our ego had certainly had plenty of target-audience endurance training. The week with the students turned out to be a wonderful and laughter-filled adventure. From the kindergarteners who were happy to try anything, to the 6th grade boys fake-farting during savasana, to the 7th and 8th grade girls who thanked us with hugs, to the impromptu headstands and various other permutations of yoga poses kids would explode into, we were reminded of all the lessons we spend so much time learning as adult yogis: everyone’s body is different, there are poses you can do and others you can’t (but that changes), some stuff is easy and other stuff is not, sitting still is the hardest pose, and when one person starts laughing, it’s hard not to start laughing too. Halfway through the teaching, my daughters asked whether kids in other grades were enjoying the yoga lessons. I told them some kids did and others were bored, and asked them to tell me what they thought could make it a more fun experience. “You have to make it about something they are into, like sports or something,” they suggested, adding, “and pick cool music not Sting.” Although we clearly disagree on the Sting front (he will be eternally cool, as long as I’m concerned), we agreed that any activity is more fun if you relate it to something you like – and for my girls, that something happens to be anything Harry Potter. 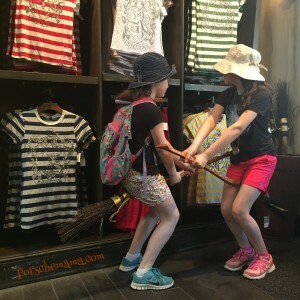 The girls’ love of J.K. Rowling’s epic story inspired us to work together to write up the class below – a Harry Potter Yoga class suitable for kids 8 and up. You will need: comfortable clothing, a yoga mat, and a big imagination. Wand optional. Music: any of the Harry Potter soundtracks (see below) would be awesome, but any music you or your child likes works. Begin in Hogwarts Pose (mountain pose). Stand tall like the castle. Take 3 deep breaths, raising your hands above your head on inhale and bringing them back down on each exhale. Use all your breath – see if you can have your hands and breath begin and end at the same time. (exhale) Bow Forward (forward fold) respectfully to greet Dumbledore. (inhale) Look-Out Pose (monkey): extend the torso forward. Fingertips on the shins or on the mat, depending on flexibility. (exhale) Pushup-down (modified chaturanga): Drop the knees first, then keep elbows close to the body, bending them until you are flat on your mat, belly-down. 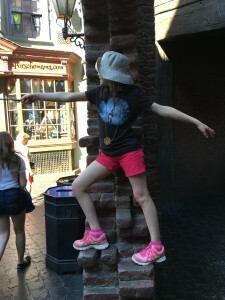 Quiddich Pose in Diagon Alley. (inhale) Slitherin Pose (cobra pose): Curl chest up, keeping legs on the mat. Exhale making a snake sound. (exhale) Down Fang Pose (downward-facing dog): press the palms down into the mat and reach the heels back toward the mat for 3-5 breaths. Crookshanks Pose (cat pose). (Inhale) as you look up and drop your belly, and (exhale) as you arch your back (like when Crookshanks gets angry when he sees Scabbers!). Alternate between the two versions for 3-6 breaths. (exhale) Scabbers Pose (squat). Squat down with hands up like mouse. Scare Crookshanks! Heels may or may not touch the ground depending on flexibility. Hold for 3 breaths. (exhale) Down Fang. Hold 1-3 breaths > (exhale) hop forward to Bow Forward > (inhale) come up to Hogwarts Pose. (inhale) Hogwarts Pose > (exhale) Forward Bow > (inhale) Look-Out pose > (exhale) Basilisk Pose (inhale) >(exhale) Pushup-down. (inhale) Up Fang Pose (upward-facing dog): extend the legs strong behind you and lift the chest up for 1 breath. (exhale) Down Fang > (exhale) hop forward > (inhale) come up to Hogwarts Pose. (exhale) Quiddich Pose (chair pose). Sit down low, knees together. Extend arms forward to hold your Nimbus 2000. Hold for 2 breaths. Moving to catch the Golden Snitch is allowed! (exhale) Norbert/Norberta Pose (lunge or dragon). Right leg steps back for lunge, knee down on the mat. Reach arms above your head along your ears. Hold for 1-3 breaths. (inhale) Fluffy Pose (three legged dog pose). From Down Fang, raise right leg behind you. Keep the hips square at first. When you are comfortable, open the hip and bend the knee. Hold for 1-3 breaths. Wizard Casts A Spell at Diagon Alley. (exhale) Unicorn Pose (warrior I). Step the right foot forward and place the left foot flat. Extend arms along your ears to form your unicorn horn. Hold for 2 breaths. (exhale) Wizard Casts A Spell Pose (warrior II). Open the body to the side and extend the arms. Hold on to your wand, lean in, and say, Expelliarmus! To disarm a Death Eater. Hold for 2 breaths. (exhale) Wizard Gets Hit by a Spell Pose (reverse warrior). Oh no, a Death Eater got you! Extend your left arm along your left leg and bring the right arm over your right ear. Say, Protego! Whew, spell deflected! Hold for 2 breaths. (inhale) Wizard Casts A Spell Pose for 1 breath. (exhale) Hippogriff Pose (half moon pose). Balancing on your right leg, lean forward and reach your right hand toward the ground. Raise the left leg and keep it active. Hippogriffs really are nice … unless you’re Draco. Hold for 2-3 breaths. (exhale) step back to Wizard Casts A Spell Pose. (exhale) Norbert/Norberta, right leg comes forward, (inhale) arms come up powerfully to make your dragon crest. (exhale) Dementor Pose (warrior III). Lean forward, balance on right leg, raise left leg behind you keeping hips square. Extend your arms in front of you as you fly. Hold for 2-3 breaths. (exhale) step back to Norbert/Norberta. (exhale) Dementor Pose on left side. Hold for 2-3 breaths. Forbidden Forest Tree Pose (tree pose). Plant the left foot and bring the right leg up, placing the foot below or above the knee (but not on the knee joint). Hold for 2-3 breaths. Come back to Hogwarts Pose. Plant right foot and do other side. (exhale) Fawkes Pose (eagle pose). Plant the left foot, wrap the right leg around the left leg and the right arm under the left as you squat down. See if you can be calm about change like Dumbledore’s Phoenix. Hold for 2-3 breaths. Come back to Hogwarts Pose. Plant right foot and do other side. Hold 2-3 breaths. Unicorn Pose (with wand) at Hogsmeade. (exhale) Chocolate Frog Pose (frog). Time for a treat! Squat down and reach the palms to the ground. Hold for 2-3 breaths. Hopping and croaking is ok! When you’re done, hop back to plank for your Vinyasa. Optional: Hagrid’s Pumpkin Patch Crow Pose (crow pose). If the adult practicing has experience with yoga, you can help the kiddos give crow a try. Kids love trying arm balances! If you’ve never tried this pose, I suggest working with an instructor. (inhale) Moaning Myrtle Pose (camel). From Down Fang, drop your knees down. Place your hands behind your head and reach your chest toward the ceiling, stretching your back. Moaning is optional. Hold 2 breaths. (inhale) Wand Pose (staff pose). Sit and extend your legs in front of you, (exhale) and bend forward. Hold for 2-3 breaths. (exhale) Hogwarts Boat Pose (boat pose). As you exhale, come up to form one of the boats that bring the 1st years across the loch to Hogwarts. Arms can be along the legs or extended. Hold 2-3 breaths. Repeat 3 times. Lie flat on your mat. Wingardium Leviosa Pose (scale pose). Cross your legs “criss-cross applesauce.” Now press your palms on either side and say, wingardium leviosa! while you push your palms into the mat and lift your belly. Baby Harry Pose (happy baby). Before Voldemort, Harry was a happy baby – and now that you’ve practiced, you are too! Enjoy this relaxing pose for 2-3 breaths. Silencio Pose (savasana). Lie on your mat, arms and legs extended and relaxed, and fall under the quiet spell of silencio. 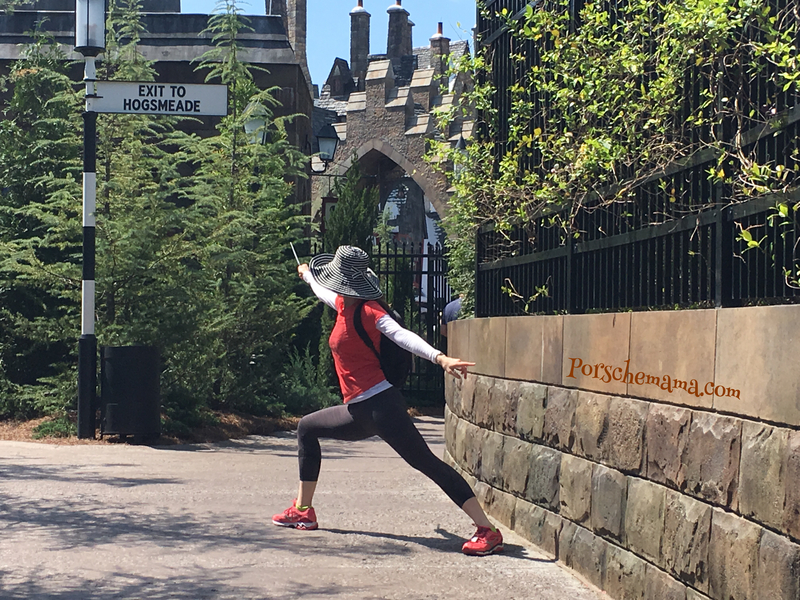 Your Harry Potter Yoga practice is done. Good job! 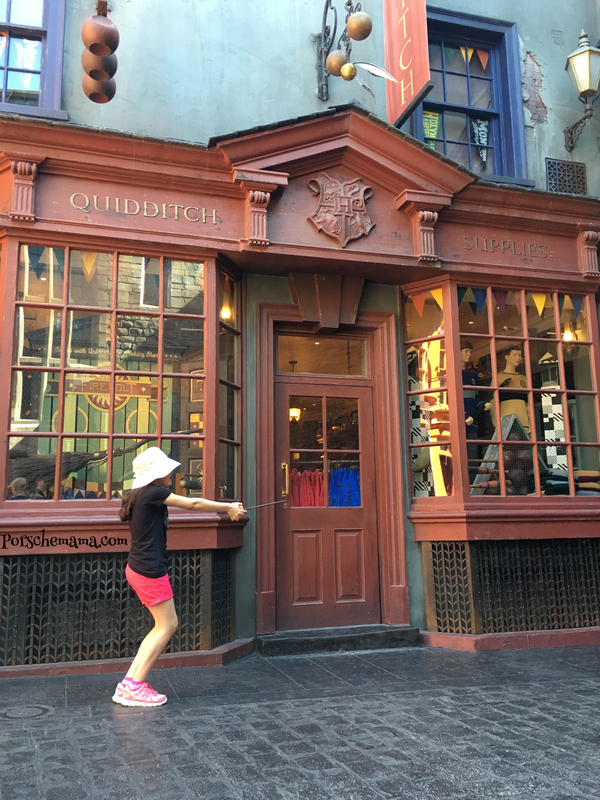 This yoga flow is a work of fan using characters from the Harry Potter world, which is trademarked by J. K. Rowling. All characters are created and owned by J.K. Rowling, and I do not claim any ownership over them or the world of Harry Potter. The yoga flow above is my own invention, and it is not purported or believed to be part of J.K. Rowling’s story. This is such a clever and fun idea! And really well thought out. I’m going to try it with Eva (who thinks yoga is boring even though she’s very good at it).